Pontius Pilate's wife (Greek: Πιλᾶτος (Pilate), γυνὴ αὐτοῦ (his wife); Latin: uxor Pilati; fl. 1st century) is unnamed in the New Testament, where she appears in a single verse of the Gospel of Matthew. In later Christian tradition, she is known variously as Saint Procula (also spelled Proculla or Procla), Saint Claudia, Claudia Procles or Claudia Procula. Christian literature and legends have amplified the brief anecdote about Pilate's wife in the New Testament. While Pilate was sitting in the judgment hall, his wife sent him a message: "Have nothing to do with that innocent man, because in a dream last night, I suffered much on account of him." Pilate did not heed the warning of his wife, who is not named in the Gospel. The name "Claudia" appears only once in the New Testament, apparently referring to a different person, in the Second Epistle to Timothy 4:21: "Eubulus, Pudens, Linus and Claudia send their greetings, and so all the other Christians." Pilate's wife is referred to in the apocryphal Gospel of Nicodemus (probably written around the middle of the 4th century, although it is mentioned by Justin Martyr), which gives a more elaborate version of the episode of the dream than Matthew. She is first named as Claudia in 1619, in the chronicle of Pseudo-Dexter. In later Christian tradition she is known as Claudia Procula. In the 3rd century, Origen suggested in his Homilies on Matthew that the wife of Pilate had become a Christian, or at least that God sent her the dream mentioned by Matthew so that she would convert. This interpretation was shared by several theologians of Antiquity and the Middle Ages. Rival theologians contended the dream was sent by Satan in an attempt to thwart the salvation that was going to result from Christ's death. Procula is recognized as a saint in two churches within the Eastern Christian tradition: the Eastern Orthodox Church and the Ethiopian Orthodox Church. In the Eastern Orthodox Church, she is celebrated on 27 October. The Ethiopian Orthodox Church celebrates Pilate and Procula together on 25 June. A letter, purportedly written in Latin by Pilate's wife from "a little Gallic mountain town" several years after Pilate left Jerusalem, was first published in 1865 in Slovenian in the Catholic journal Kmetijske in rokodelske novice, volume 23, number 15, pages 117-120. An English translation by Catherine Van Dyke was published by Pictorial Review magazine in April 1929. The letter states that Pilate's wife successfully sought Jesus' aid to heal the crippled foot of her son Pilo. Pilate's wife is sometimes shown in medieval depictions of scenes including her husband. She typically stands behind him, sometimes whispering in his ear. The seventeenth-century English poet Aemilia Lanyer (whom A. L. Rowse believed to be the dark lady of Shakespeare's sonnets) wrote a poem, Salve Deus Rex Judaeorum (1611), in which Pilate's wife is the main speaker. She makes reference to the Fall of Adam and Eve and argues that Pilate's sin in killing Christ abrogates the curse on Eve, since Pilate sinned by not listening to his wife (unlike Adam, who sinned by hearkening to the voice of Eve). Pilate's wife (who is never named in Lanyer's poem) thereby becomes a champion of women's emancipation. She is a major character in the Tapisters' and Couchers' Play of the York Mystery Plays cycle, where she introduces herself as "Dame Precious Percula". Her dream is dictated by the Devil. He first soliloquises to the effect that if Jesus dies, he, the Devil, will lose control of men's souls. He then tells the sleeping Percula that Jesus is innocent, and that if he is condemned, she and Pilate will lose their privileged position. She wakes and sends a message to Pilate, but Annas and Caiaphas succeed in convincing him that her dream was inspired by Jesus's witchcraft. Charlotte Brontë wrote the poem "Pilate's Wife's Dream" in 1846. The biblical scholar Paul Maier, in Pontius Pilate: A Biographical Novel (1968), attempts to take what is known from the documented record and from there construct a fictional narrative as connective material. Maier refers to Pilate's wife as "Procula," arguing that the name "Claudia" only comes from a later tradition. In his historical novel "The Advocate", Randy Singer refers to Pilate's wife as "Procula" and tells of an earlier vision in which she had seen and been healed by Jesus. Novels inspired by Pilate's wife include The Bride of Pilate (1959) by Esther Kellner; and Pilate's Wife: A Novel of the Roman Empire (2006), & Claudia: Daughter of Rome (2008), both by Antoinette May. All books use the name Claudia, and May's book depicts her parents as Roman aristocrats related by blood to Emperor Augustus. Pilate's Wife by H.D. (Hilda Doolittle), written between 1929 and 1934 but posthumously published in 2000, presents Pilate's wife with the name Veronica. Carol Ann Duffy's 1999 poetry collection 'The World's Wife' also contains a poem titled 'Pilate's Wife'. The Dream of Pilate's Wife (ca. 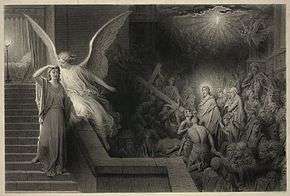 1879), engraving by Alphonse François, after Gustave Doré. In theater, the life of Pilate's wife has been the subject of the dramas “A Play for Easter” by Jewell Ellen Smith and “Claudia Procula” by Curt M. Joseph. Andrew Lloyd Webber's Jesus Christ Superstar attributes the dream to Pontius Pilate instead of his wife in the song "Pilate's Dream". In films, Pilate's wife was called "Proculla" in the Cecil B. DeMille epic The King of Kings (1927); Majel Coleman played the role. She had a major part in Julien Duvivier's Golgotha (1935), played by Edwige Feuillère. She is mentioned briefly in Pilate's hand-washing scene in The Robe (1953) ("Even my wife had an opinion"). Other notable cinematic references include Barbara Billingsley in the Day of Triumph (1954), Viveca Lindfors in the King of Kings (1961) (where she is identified as the daughter of the Emperor Tiberius), Jeanne Crain in the Italian film Ponzio Pilato (1962), and Angela Lansbury in the epic The Greatest Story Ever Told (1965). She is also depicted in the film The Inquiry (1986), where she is played by Phyllis Margaret Logan, as well as in the remake of The Inquiry (2006), played by Anna Kanakis. In the film The Passion of the Christ (2004), she is known as Claudia Procles (played by Claudia Gerini). In this film, Claudia fails in her effort to lobby her husband to save Jesus, and consoles Jesus' mother Mary and Mary Magdalene as she generously hands them towels to clean up the blood from his scourging. Pontius Pilate's wife also has appeared in comedy: John Case played her in Monty Python's 1979 Life of Brian. On television, Pilate’s wife was played by Joan Leslie in the 1951 Family Theater episode "Hill Number One" (also starring James Dean as John the Apostle), and by Geraldine Fitzgerald in the 1952 Studio One episode "Pontius Pilate" (where Procula is depicted as half-Jewish, and is brought before Pilate as a Christian rebel herself, fifteen years after Jesus' death.) Hope Lange played her in the 1980 made-for-television film The Day Christ Died. More recently, Pilate's wife is featured in the 2008 TV serial The Passion, played by Esther Hall, and in the 2013 miniseries The Bible, portrayed by Louise Delamere. Delamere reprised her role in 2014's Son of God. Joanne Whalley portrayed Pilate's wife in the 2015 series A.D. The Bible Continues. The purported letter of Procula in recent times has become associated with the alleged mystery of Rennes-le-Château by French authors Christian Doumergue and Kris Darquis. ↑ Herbermann, Charles, ed. (1913). "Acta Pilati". Catholic Encyclopedia. New York: Robert Appleton Company. ↑ Erwin Preuschen, Zeitschrift für die Neutestamentliche Wissenschaft und die Kunde der älteren Kirche, Volumes 86-87 (Berlin: W. de Gruyter, 1995). ↑ Katrina B. Olds, Forging The Past: Invented Histories in Counter-Reformation Spain, page 119 (Yale University Press, 2015. ISBN 978-0-300-18522-5). 1 2 Herbermann, Charles, ed. (1913). 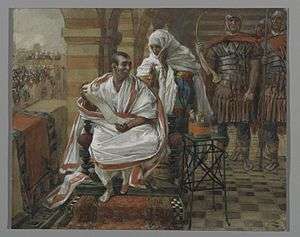 "Pontius Pilate". Catholic Encyclopedia. New York: Robert Appleton Company. ↑ "The Fate of Pontius Pilate," Hermes 99.3 (1971), p. 362. ↑ Time Magazine, 1963-04-12: "Gospel According to Claudia"
↑ Randy Singer. The Advocate. Tyndale House Publishers, Inc. (May 1, 2014), ISBN 978-1414391304. ↑ USA Today coverage of "Pilate's Wife"
↑ Original score listing for "Jesus Christ Superstar". Retrieved from http://www.ibdb.com/production.asp?ID=3614. ↑ Halliwell, Leslie (2003). Halliwell’s Film & Video Guide. HarperResource. ISBN 0-06-050890-6. ↑ Chapman, Graham; Cleese, John; Gilliam, Terry; Idle, Eric; Jones, Terry; Palin, Michael (1979). Monty Python's The Life of Brian/Montypythonscrapbook. London: Eyre Methuen. ↑ Joanne Whalley plays "Claudia" in :AD: The Bible Continues"
↑ Kris Darquis, Claudia Procula, Epouse de Ponce Pilate, Amie de Marie Madeleine (2014, ISBN 979-1093291048).